Picture: Colin Elder 7 yrs. 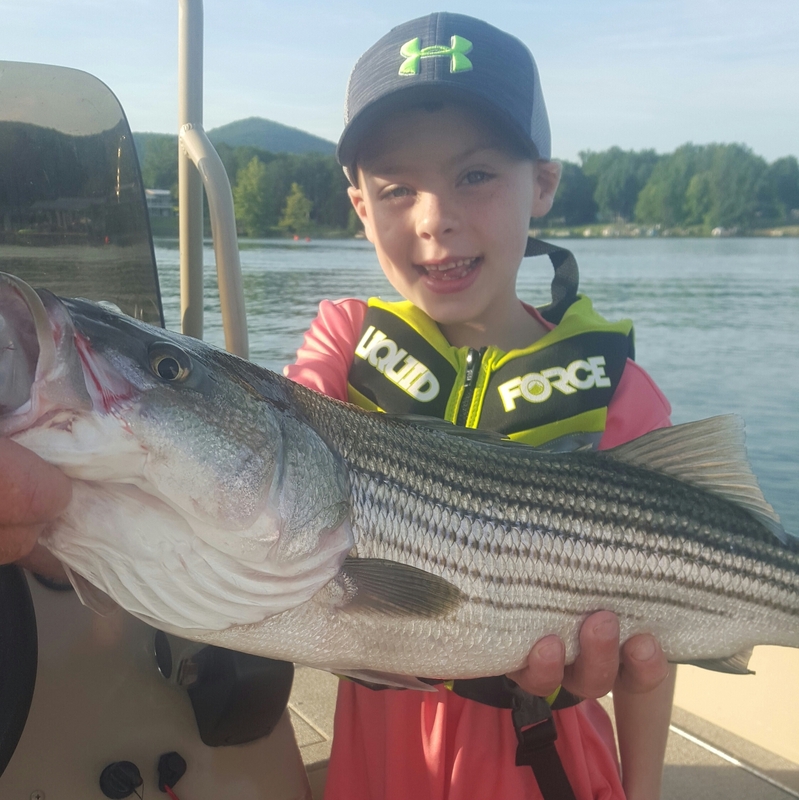 old from Brookneal, Va., with his first striper that was caught & released in September, while fishing with his grandfather John Mason and Captain Dale. OVERVIEW- Fishing will be good in the coming weeks! Largemouth bass fishing has been good during the day the past few weeks! Water temperature will be in the 70’s. Best times will be early morning & late afternoon. October is a good month to fish Smith Mtn. Lake. Largemouth Bass- Fishing for largemouth bass will be good this month. 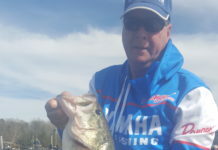 Best lures will be top water lures, plastic worms, jigs, drop shots, crank baits, Carolina rigs and shaky heads. Points, brush piles, rocky areas, humps and docks will be the best areas to try your luck. Best depths will be from surface to 30 feet deep. Remember to take care of the bass and release them! Smallmouth Bass- Fishing will be good. Best areas will be humps, ledges and rocky areas. Best lures will be tubes, jigs, jerk baits, top water lures, hair jigs and crank baits. Best areas will be in the mid to the lower sections of the lake. Cloudy days with light wind are good times to try your luck! Look for areas with rocky ledges next to deep water. Smallmouth will feed on top some this month. Most smallmouth bass will suspend near schools of baitfish and deep ledges. Striped Bass- Fishing will be good this month. 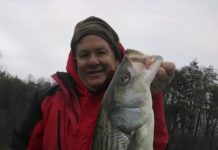 Stripers will be caught in the mid sections of the lake, the lower sections towards the dam and with start to migrate up the main rivers later this month.. Best lures will be swim baits, buck tails and Zoom flukes fished on 1/4 to 1/2 oz. lead heads. Best time to fish is cloudy days, early morning and late afternoon. The best depths will be from the surface to 60 feet deep. Live bait fished on down lines and planner boards work this month. The stripers will constantly be on the move. Find the largest concentration of shad. Night fishing will be fair this month. Some schools of stripers will surface this month. Crappie- Fishing for crappie will be good this month. The best depths will be 5 to 15 ft. deep. Crappie will be found around docks, brush piles, and fallen trees. Docks with brush piles are usually good areas that hold crappie. Small live minnows and 1½ to 2 inch tubes or shad shaped plastic lures fished on 1/32 to 1/16 oz. lead heads will work best to catch crappie this month. Best areas are the main creeks and the upper section of the lake. Very light line helps when crappie fishing. TIP OF THE Month- This month fish will be constantly on the move!. Look for fish to move shallow towards the end of the month. Try to find the areas with the largest concentration of bait fish. Seagulls will start to arrive later this month. 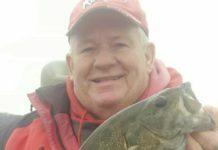 You can also hear reports about local fishing on the website: THE BASS CAST RADIO SHOW & WSLK radio each month. Make sure your running lights are on after dark & wear your life jackets! Remember to TAKE A KID FISHING!